As is always the case at awards shows, celebrities attending the 2018 Oscars dressed to impress — and often, there was a story behind the outfits they chose to wear. For example, Girls Trip star Tiffany Haddish wore a gown that celebrated her Eritrean heritage. But it turns out that the meaning behind one star’s look went largely unnoticed. Jordan Peele’s antler pin on the lapel of his suit jacket was a sneaky homage to his Oscar-nominated film Get Out. 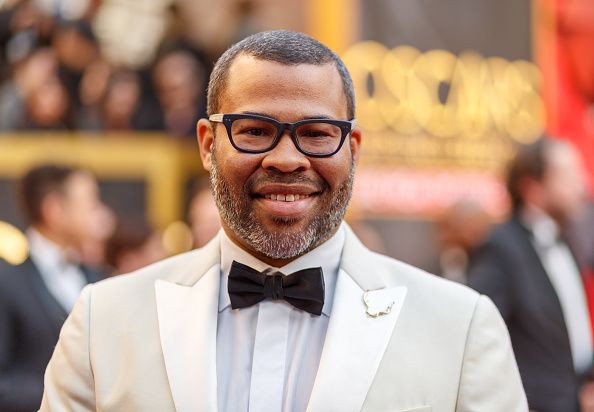 Peele, who was nominated for Best Director and Best Screenplay for Get Out, arrived at the red carpet wearing a dapper white Calvin Klein tuxedo jacket. And while many commented on the former Key & Peele star’s ensemble, few noticed the gold antler pin attached to his lapel. The pin, it turns out, was a sly reference to Get Out. In the opening scene, the film’s main characters, Chris and Rose, hit and kill a deer en route to Rose’s parents house. And deer continue to carry a symbolic meaning throughout the duration of the movie, with Peele often drawing parallels between black men and the hunting game. Peele ended up winning Best Screenplay during the March 4th ceremony, making him the first black screenwriter to do so. In addition, Get Out has also made history as the first debut feature film helmed by a black writer-director to gross more than $100 million at the box office. The movie’s many accolades suggest that Peele’s adept use of symbolism was recognized, even if it wasn’t as noticeable in his wardrobe choices. But even beyond the deer symbolism, Peele has made it clear that he intended Get Out to uncover racial tensions in America. "The message I was trying to convey is that we're never done with the conversation about race," Peele said in his red carpet interview. "I wrote this movie in a post-race America, quote-on-quote, and it felt like we were kind of hoping we were past a certain amount of conversation, and this movie, I think and I hope it plugged some hole and has helped inspire more conversation that's needed today." Congratulations to Peele on his historic win, and congratulations to the cast and crew of Get Out for making such an important and high-quality movie.